Bell & Howell is a U.S.-based former manufacturer of motion picture machinery, founded in 1907 by two projectionists, and headquartered in Wheeling, Illinois. The company now provides inserting and finishing solutions for letters and parcels, document processing, microfilmers, scanners, and financial services. The "Bell & Howell" trademark is also licensed to makers of various electronic consumer products. 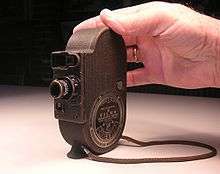 According to its charter, the Bell & Howell Company was incorporated on February 17, 1907. It was duly recorded in the Cook County Record Book eight days later. The first meeting of stockholders took place in the office of Attorney W. G. Strong on February 19 at 10 a. m. The first board of directors was chosen for a term of one year: Donald Joseph Bell (1869-1934), chairman; Albert Summers Howell (1879-1951), secretary; and Marguerite V. Bell (wife of Donald Bell), vice chairman. Austin Delaney was president of Bell and Howell in Canada in the 1960s and 1970s before moving with his family from England. In 1934, Bell & Howell introduced the first light weight amateur 8-mm movie camera, in which the film was loaded in a cassette that allowed daylight loading and unloading. Although known for manufacturing their film projectors, a partnership with Canon between 1961-1976 added still photography to their product lineup - their 35mm SLR cameras were manufactured by Canon with the Bell & Howell logo in its place. 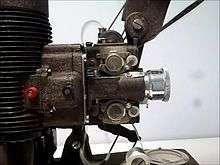 The firm dropped the production of movie cameras in the early 1970s. Bell & Howell is a supplier of media equipment for schools and offices. The film laboratory line is now a separate company, BHP Inc, which is a division of Research Technology International. The firm added microfilm products in 1946. It purchased University Microfilms International in the 1980s. UMI produced a product called ProQuest. In the 2000s, Bell and & Howell decided to focus on their information technology businesses. The imaging business was sold to Eastman Kodak and the international mail business was sold to Pitney Bowes. On June 6, 2001 Bell & Howell became ProQuest Company (NYSE "PQE"). In September 2001, the remaining industrial businesses, along with the Bell & Howell name, were sold to private equity firm Glencoe Capital. The company merged with the North American arm of Böwe Systec Inc. in 2003; Böwe Systec later acquired the entire company. It was known as Böwe Bell & Howell until 2011, when Versa Capital Management bought the company from bankruptcy and returned it to its original name. They also had an Electronics and Instrumentation Division on Lennox Road, Basingstoke, UK. This facility produced several different types of transducers for applications such as North Sea oil platforms and the Ariane Space vehicles. 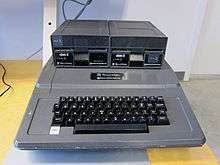 Bell & Howell marketed a specially designed Apple II Plus computer to the educational market beginning in July 1979. The modified Apple had additional security elements for classroom use such as a tamper-proof cover. The case color was black but the inside was a standard Apple II Plus. 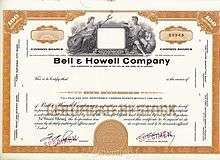 Bell & Howell founded an Education Group within their company in 1907. This Education Group created Bell & Howell Schools in 1966. In that same year, the Education Group purchased a controlling share of DeVry Institute of Technology. Two years later in 1968, Bell & Howell’s Education Group, via a controlling interest in DeVry, acquired Ohio Institute of Technology in Columbus, Ohio. Over the years, the Education Group has bought and sold large interests in a variety of educational organizations and institutions. TeleMation Inc. In 1977, TeleMation inc. became a division of Bell and Howell. ↑ "Bell + Howell". Bellhowell.com. Retrieved 2014-08-16. ↑ Paula J. Hane (2001-06-11). "Bell & Howell Becomes ProQuest Company". Newsbreaks.infotoday.com. Retrieved 2014-08-16. ↑ Senior Process Engineer. Books.google.co.nz. 1982-10-07. Retrieved 2014-08-16. ↑ "Apple and Bell & Howell Enter Education Market". Intelligent Machines Journal. InfoWorld Media Group. 1 (11): 77. July 18, 1979. ISSN 0199-6649. ↑ "Apple II Plus - Bell & Howell Model – Introduction". The Mac Geek. Pearl City Networks. 2010. Retrieved August 1, 2013. 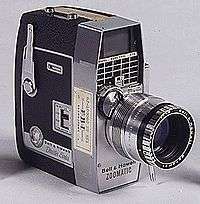 Wikimedia Commons has media related to Bell & Howell. The Zapruder Camera Bell & Howell 414PD Director Series - Overview and User's Manual.